Pope Francis declared his two predecessors John XXIII and John Paul II saints on Sunday before hundreds of thousands of people in St. Peter's Square, an unprecedented ceremony made even more historic by the presence of retired Pope Benedict XVI. Never before has a reigning and retired pope celebrated Mass together in public, much less at an event honoring two of their most famous predecessors. 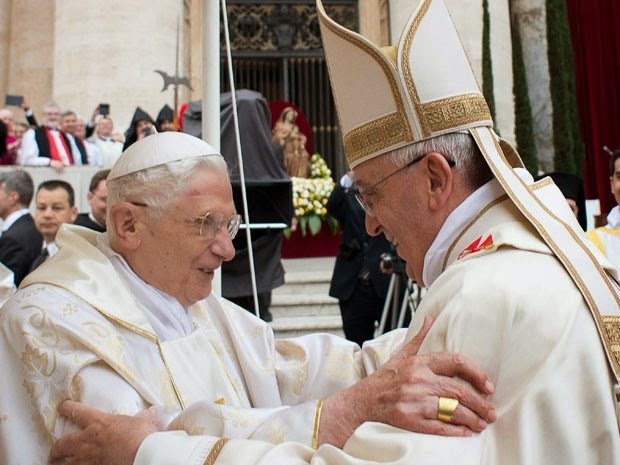 Benedict's presence was a reflection of the balancing act that Francis envisioned when he decided to canonize John and John Paul together, showing the unity of the Catholic Church by honoring popes beloved to conservatives and progressives alike. Francis took a deep breath and paused for a moment before reciting the saint-making formula in Latin, as if moved by the history he was about to make. 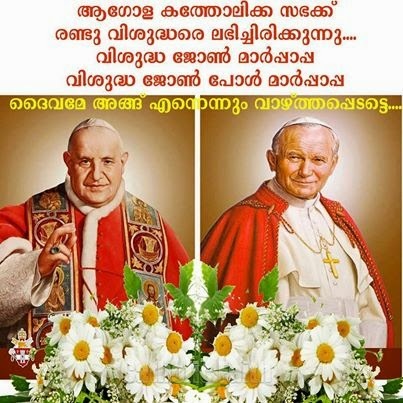 He said that after deliberating, consulting and praying for divine assistance "we declare and define Blessed John XXIII and John Paul II be saints and we enroll them among the saints, decreeing that they are to be venerated as such by the whole church." Applause broke out from a crowd that stretched from St. Peter's to the Tiber River and beyond. 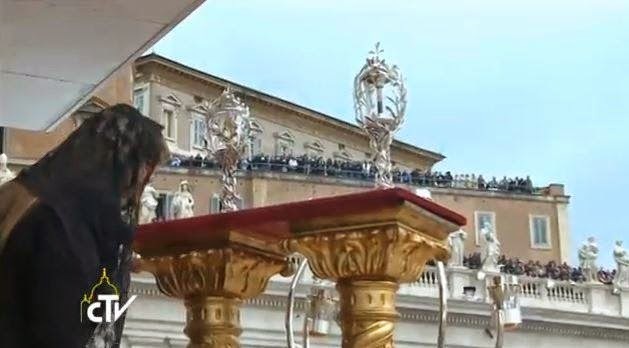 Benedict was sitting off to the side of the altar with other cardinals. He had arrived in the square on his own to cheers and applause, wearing white vestments and white bishops' miter. He stood to greet Italy's president and later Francis when he arrived, and sang along during the hymns that followed the canonization rite. 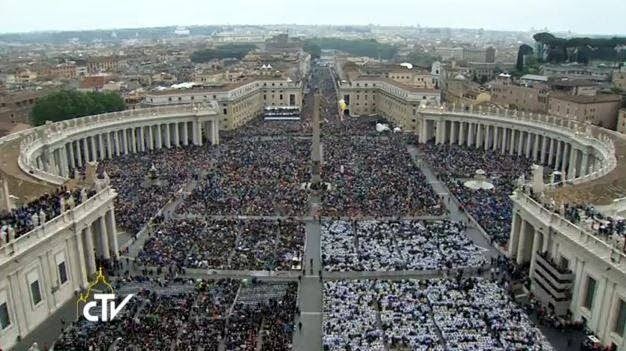 Italy's interior ministry predicted 1 million people would watch the Mass from the square, the streets surrounding it and nearby piazzas where giant TV screens were set up to accommodate the crowds eager to follow along. By the time the ceremony began, Via della Conciliazione, the main boulevard leading from the square, nearby streets and the bridges across the Tiber were packed. Polish pilgrims carrying the red and white flags of John Paul's beloved homeland had been among the first to push into the square well before sunrise, as the human chains of neon-vested civil protection workers trying to maintain order finally gave up and let them in. 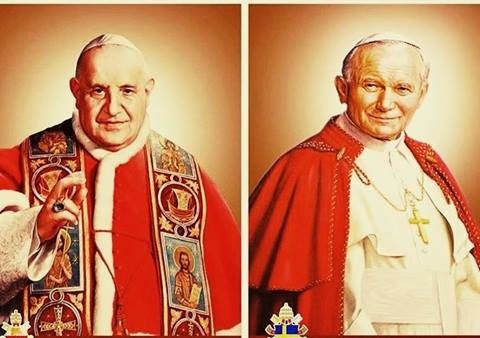 "Four popes in one ceremony is a fantastic thing to see and to be at, because it is history being written in our sight," marveled one of the visiting Poles, David Halfar. "It is wonderful to be a part in this and to live all of this." Most of those who arrived first at St. Peter's had camped out overnight nearby on air mattresses and sleeping pads. Others hadn't slept at all and took part in the all-night prayer vigils hosted at a dozen churches in downtown Rome. 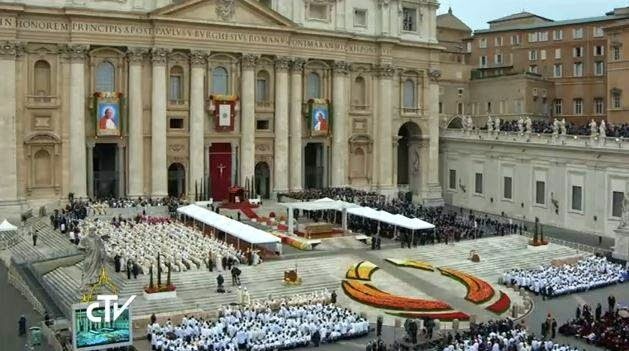 By mid-morning, the scene in the square was quiet and subdued — perhaps due to the chilly gray skies and cumulative lack of sleep — unlike the rollicking party atmosphere of John Paul's May 2011 beatification when bands of young people sang and danced in the hours before the Mass. Benedict had promised to remain "hidden from the world" after resigning last year, but Francis has coaxed him out of retirement and urged him to take part in the public life of the church. 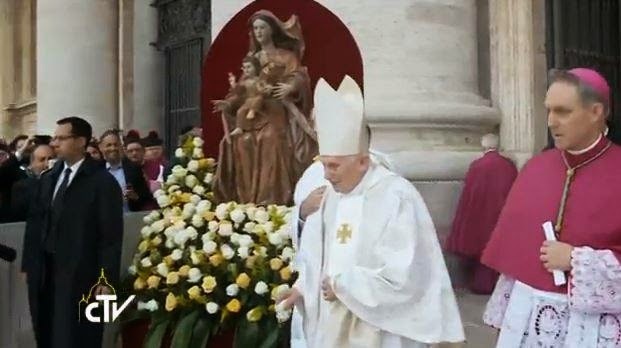 In a dress rehearsal of sorts, Benedict attended the February ceremony in which Francis installed 19 new cardinals. 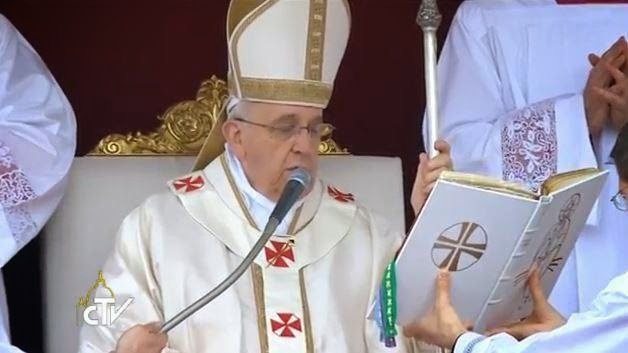 But celebrating Mass together with Francis was something else entirely, a first for the 2,000-year-old institution and a reflection of Francis' desire to show the continuity in the papacy, despite different personalities, priorities and politics. Pope John XIII, who reigned from 1958-1963, is a hero to liberal Catholics for having convened the Second Vatican Council. 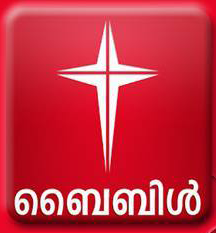 The meetings brought the church into the modern era by allowing Mass to be celebrated in local languages rather than Latin and by encouraging greater dialogue with people of other faiths, particularly Jews. During his quarter-century papacy from 1978-2005, John Paul II helped topple communism through his support of Poland's Solidarity movement. 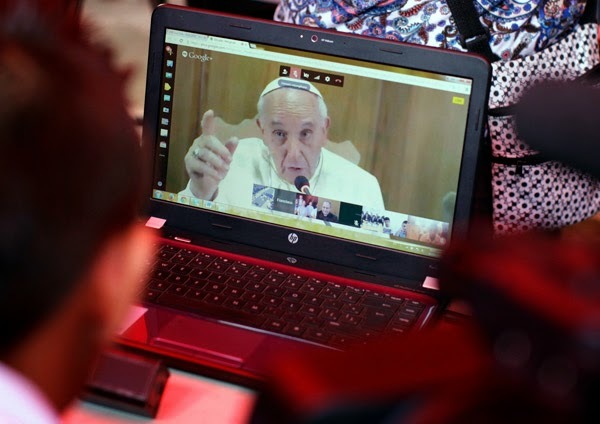 His globe-trotting papacy and launch of the wildly popular World Youth Days invigorated a new generation of Catholics, while his defense of core church teaching heartened conservatives after the turbulent 1960s. "John Paul was our pope," said Therese Andjoua, a 49-year-old nurse who traveled from Libreville, Gabon, with some 300 other pilgrims to attend. She sported a traditional African dress bearing the images of the two new saints. "In 1982 he came to Gabon and when he arrived he kissed the ground and told us to 'Get up, go forward and be not afraid,'" she recalled as she rested against a pallet of water bottles. 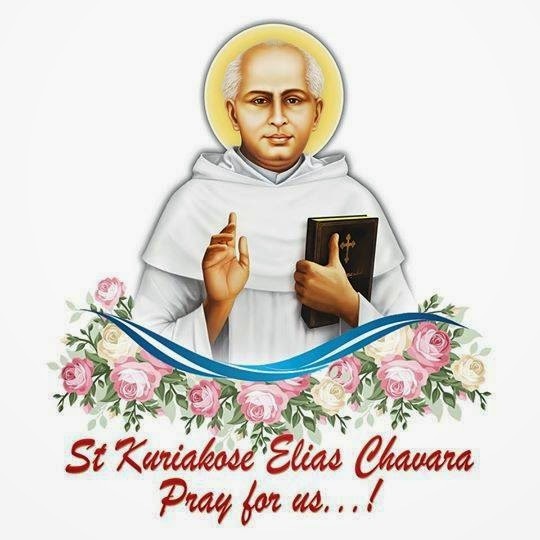 "When we heard he was going to be canonized, we got up." Kings, queens, presidents and prime ministers from more than 90 countries attended. Some 20 Jewish leaders from the U.S., Israel, Italy, Francis' native Argentina and Poland were also taking part, in a clear sign of their appreciation for the great strides made in Catholic-Jewish relations under John, John Paul — and their successors celebrating their sainthood.